The technology side of true digital transformation is about bringing information into the fabric of every transaction with a client, partner, employee and process. Digital enterprises leverage information to inform decisions in ways never before possible, to outplan and outexecute rivals. 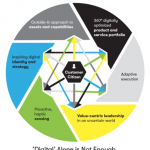 A digital strategy will drive a different organizational structure – more longitudinal than hierarchical, a different product/service strategies all taking advantage of enhanced relationships with customers and partners, whilst creating natural collaboration across a employees – many of whom will now be sourced from outside the company. Agile Applications and Digital Experiences – Leverage agile applications and digital experiences. Bring information into the experience to improve context, personalization and value, and use API-driven design to increase speed to market for new and existing apps. Enabling the Enterprise Through Hybrid Cloud – Operate the enterprise in the cloud. Clouds provide a more consumerized experience for the business with a pace, quality and standardization that cannot be matched in bespoke IT. Empowering Workforces with Invisible IT – Enable secure, productive mobile employees. Deliver better, faster, richer, more collaborative and more personal interactions and transactions, while improving information security in our regulated world. Productivity thru Streamlined & Learning Processes – Enterprise processes are the sand in an automated enterprise, changing the way that information is used to guide and reform processes creates an enterprise that is constantly re-inventing processes and generating exponential improvements in productivity. Thriving on Enterprise Data and Analytics – Operate an information-driven digital business. Information must become the currency of the organization, with analytics driving correlation and insights to improve everything, and business decisions beginning to support the move from design and perfection to rapid experimentation. Managing Enterprise Risk in a Connected World – Manage the increasing complexity of operational risk, which permeates not only security but also availability, serviceability and regulatory execution. Security risks increase as the value of information grows, but other technology risks must become part of the conversation as businesses become more reliant on technology. Defining the Future of Digital Insurance – Deliver entirely new customer experiences, harnessing analytics and automation, via products centered on well-being, safety and the achievement of personal goals. Healthcare 3.0 Is Digital – Adopt patient-centric care powered by actionable information, distilled from numerous disparate data sources, that can improve outcomes for individual patients, cohorts and populations. Building a Connected Transportation Platform – Deploy a connected transportation platform that unifies data throughout the value chain to create new value for both passengers and cargo during the entire journey. A transformed organization recognizes the benefits of automation, robotics and straight-through processing to remove humans (and human error) from the workflow for improved accuracy, speed and reliability. The organization relies on well-considered business logic and policies to determine how data should be used. Further, it makes time for people to not only focus on process and policy improvements to the automatable components, but also dive into the information and generate business value from the weak and strong signals observed. 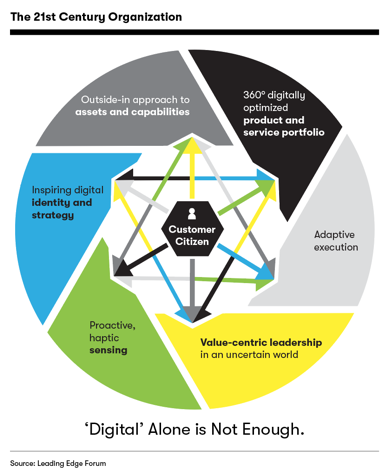 See the position paper and video, Transforming to a Digital Enterprise: An Overview.